is there any way to programmatically invoke the Scala compiler? The plugin classes (ScalaCompiler and the like) do not seem to be accessible, so my attempt was to reuse the "Compile '...'" entry (in fact, its action) in the context menu, however, I cannot find the proper action, implementing the compiler call. The reason: I'm using some own Scala DSLs (models) from which I want to generate into some other language (Prolog). Thus, for parsing the model, I need a compiled class, however, so far, I have to do it manually, which in fact I want to avoid and do the compilation automatically prior to generating into the target language. I hope, it's clear what I attempt to do. Any ideas anyone? Maybe writing a plugin for scala compiler could help? A compiler plugin lets you modify the behavior of the compiler itself without needing to change the main Scala distribution. This is not what I want to achieve. 1. 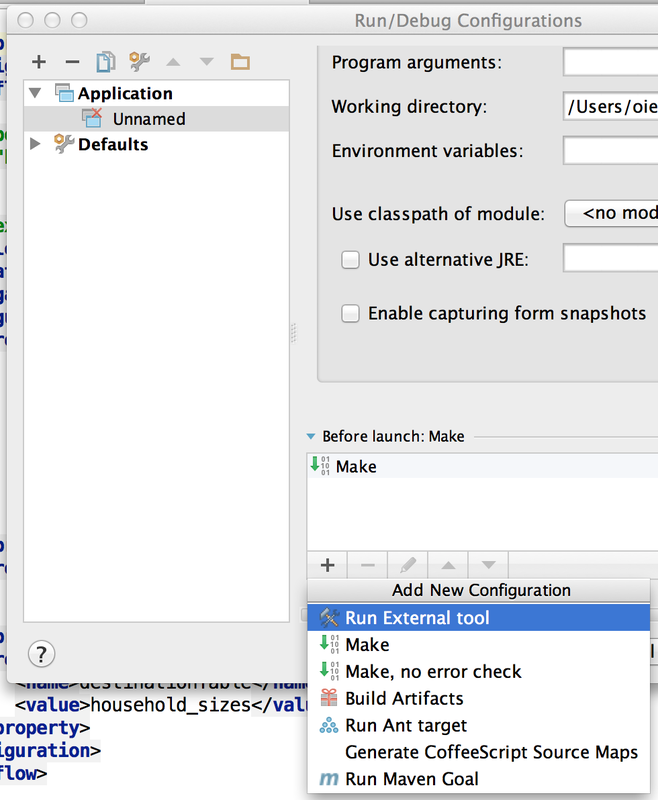 You could run Ant or Maven before launching your app in IDEA (see attached screenshot). 2. Or you could do same when building your Artifact. Thanks again for your suggestion, but again, it does not solve my problem. Calling my action shall invoke the compiler on the specified Scala file to then read the class file with a custom loader to parse it for further code generation. What you suggest already works, as it's some base functionality of IDEA. However, I do nat want to trigger it manually, but instead progamatically. I hope it's clear now what I want to do and why your suggestions don't work. Sorry, I didn't get from your 1st message that you are writing a plugin for IDEA. So, it's hardly practical to use the project compiler for purposes other than project compilation. use something like OutputListener to handle process outputs and exist code. You can see ScalacBackendCompiler for more details. thanks a lot for your reply...it put me on the right track!